Also known as Dumbbell Skull Crusher. 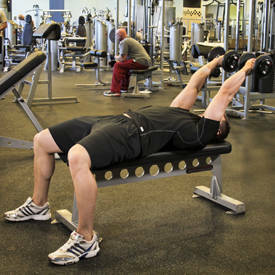 Lie down on a flat bench holding two dumbbells directly above your shoulders. Your arms should be fully extended and form a 90 degree angle from your torso and the floor. The palms of your hands should be facing forward, and your elbows should be tucked in. This will be your starting position. Now, inhale and slowly lower the dumbbells until they are near your ears. Be sure to keep your upper arms stationary and your elbows tucked in. 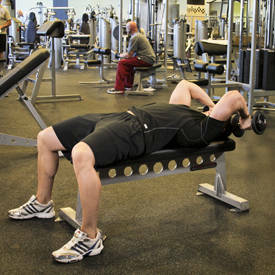 Then, exhale and use your triceps to return the weight to the starting position.